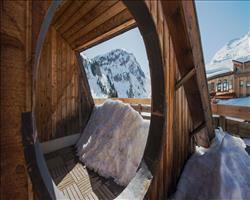 An authentic family resort at the foot of the Portes du Soleil domain. Set above the clouds at 1,800 metres (5,900 ft), the archetypally Alpine resort of Avoriaz clings to the snowy mountainside and steep cliffs. This white paradise stretches right down into the busy little streets where horsedrawn sleighs are the favoourite local transport. The Resort boasts a typically Alpine decor with its traditional wooden chalets and warm and cosy atmosphere. The Portes du Soleil ski domain runs through the heart of this pedestrian resort and stretches right into Switzerland. Its pistes welcome families and skiers of all standards. 6In Chamonix Mont-Blanc the Brévent and Flégère ski domains close on 21 April 2013 (Winter Ski 2013), and Club Med snow sports end on the same day. 7 In Val d'Isère, Chamonix Mont-Blanc, Méribel 3 resorts and Arcs Extrême, our group lessons from 12 years. Childcare and children's club facilities: Our Resort welcomes children of all ages with children's club activities according to age, run by professionals. ● Privileged areas designed just for them. ● Skiing or snowboarding lessons by professional instructors. ● The chance to take the official skiing or snowboarding diplomas. ● As well as snow sports, numerous other activities for all ages: creative activities and games. Leisure activities : Lounge and festive evenings. If you have chosen a package with transport, it includes the return flights and transfers to and from the Resort. The hotel has 248 elegant rooms in a beautifully typical mountain setting, decorated with stylish local antiques. With its delicate prints and wooden furniture, this Club Room welcomes you in an atmosphere of cosy comfort. You may want to opt for a Valley View Club Room, an Interconnecting Club Room, or a Family Club Room. Contemporary design with warm colours and furniture made of quality wood. A spacious and cosy room with a view over the valley or resort. A spacious 49 m² (527 ft²) Suite for premium comfort. On the top floor of the hotel, with a separate lounge, this Suite gives you a fine view over the valley or resort from the balcony. Full board throughout the stay including wine, beer and soft drinks with lunch and dinner. Open bar and snacks (at the restaurant) at specific times during the day and night. We update Club Med Avoriaz's details often, but facilities do change. e.g. some extras listed by the supplier as "free" or included might only be for the first time you use them, or for one time per party, then charged for further use. If any specific feature is essential to your holiday, make sure you ask us to confirm the details of it before you book your holiday. A charmingly quirky resort that’s a top ski destination for families and particularly popular for snowboarders, Avoriaz boasts a prime position in the centre of the enormous Portes du Soleil. With some of the best snow in the area and some of the best freestyle terrain in Europe, it’s well worth putting at the top of your must-ski list. Portes du Soleil: €225. Ask for a quote when booking Club Med Avoriaz. Avoriaz has N, S, E, W facing slopes. Hotel Des Dromonts Avoriaz France, Dover Ferry 14th December. "3* hotel but the staff made it as good as being in a 5*"
We had a brilliant time, this was our first Club Med holiday and we’ve already booked our next! Our rooms were clean and tidy and they went in and changed everything each day. They were just small rooms with 2 beds (imagine how a Travel Lodge room is set out), they were a bit tired looking and probably needed doing up but overall they were fine. We had no issues with noise, only the snow packer and cannons in the morning but you’re glad to have them on a ski holiday! The manager and his team were excellent. As soon as the coach dropped us off, they came to welcome us and a little snowplough with a trailer took us to the door which was a good start to the week. They all looked after us from the moment we got there. At meal times, one of the team would come over, sit with us at our table and chat to us, so you got to know them by name. The manager was a real people person and would come round for general chit chat to see what we’d been up to. When we were going back at the end of the week, they were all up at 4 in the morning and came to the snowplough to say goodbye and see us off. In the evening they do shows and the staff become part of the shows which was always so hysterical. Again afterwards they’d all come over to you to say hello. We had a cocktail night on the last night which was really good fun. When we went to the ski area they had a group for professionals, intermediates, learners etc. The manager and his team had a makeshift table where they dished out snacks and had music on, which made a great atmosphere while you were waiting to go out on the slopes. A friend plunged into the white powder group while we did intermediates with Patrick. We had 5 full days of skiing where he took us all over including off piste onto powder and the last day we had a beautiful meal. I couldn’t fault it, it was a good group and we had plenty of banter. It was all the little things like that that made the week so good and we all came away saying how they made such a difference. It wasn’t anything too fancy but we felt well looked after. The dining was tremendous, even down to the chefs behind the counters and we could try a bit of everything. In the mornings for breakfast they did pancakes, bacon, fruit salad, yoghurt, bread, cheese and ham etc. We’d come back for lunch and have a choice of salad, pastas and loads of other things. They did proper meals at night with roast beef in one corner and something else in another corner as well as pizzas and pastas. They all did speciality dishes which were separate from the buffet and included things like scallops and freshly cooked salmon. A couple might not like it as the dinner area gets quite busy but as long as you like to be sociable and get to know people it’s fine. There were lots of children running around but we were too busy enjoying ourselves to notice! "Ideal for solo travellers and young families"
On first glance, the hotel seems quite high up from the town where all the other accommodation is. This is a good thing because it means it’s quite quiet when you want to sleep. You can ski in and out and you don’t need to worry about any mammoth walks to get back every day as the village has public escalators on the internal stairways which take you about. You get breakfast, lunch and dinner which was all great. It was quite good to have lunch included in Avoriaz as there aren’t a lot of places to eat on the mountain – because you have ski in / out access, you ski straight to the boot room, hang your skis up and go for lunch. At mealtimes they had different stations, an Italian station, a traditional station and always a speciality like foie gras one night and oysters another night. There was always a salad bar too and a hot food buffet where you could get burgers and chips. If you’re going as a couple, I’d suggest eating later rather than earlier (as this is when the kids eat). The “all you can drink” bar is always a good one and all the drinks are included, cocktails and everything (and they do European measures!). We didn’t really go there for the entertainment and went out in town every evening, but for young families and single holidays it’s ideal and the people we spoke to loved it. The rooms were small but you only sleep there anyway. The only thing is that inside the hotel there are lots of stairs, there’s a lift for floors 1-3 but then you have to walk 100m to the other side of the hotel to get the next lift. They do carry your luggage for you which is good but the layout isn’t ideal when you’re with someone on crutches! You get a WiFi code which you have to pay for on arrival, which is fine but you do have to get a different code for each device. The way it works is pretty archaic... Every time you leave the building and came back, you have to log back in and if you’re halfway through writing your email and pause long enough for your phone to lock, you’d have to log in again. Overall, the hotel definitely fulfilled what we were looking for. We enjoyed spending our Christmas here, and will definitely look at doing it again. I liked the fact that you can ski up into it, which made everything easy. The food was superb, and we loved the entertainment where they got the kids involved. For Christmas, Father Christmas came in on a sled which was fun. The bedrooms were basic but that’s all you need. Staff – especially Holly – were really good! "Very good, in an easy position for skiing out"
Very good! The hotel is pretty much as it’s described in online reviews. There were a few comments about lack of cleanliness but I didn’t see that. The rooms were tiny (French tiny isn’t like UK tiny!) but you’re there for the skiing not for the bedrooms. And when it comes to the skiing the hotel has a brilliant position. The ski in, ski out is dead easy and beginners wouldn’t have a problem. We decided to all ski together so I can’t comment on the lessons. I don’t go on holiday for a super deluxe hotel but more for somewhere as a means to an end. The rooms could have been bigger and the ski room got quite busy, but then you have to be realistic that it’s a ski holiday and that’s what you get. We had a great New Year and a really nice holiday in Avoriaz. The airport lost our luggage on the way out which was a pain (we had a connecting flight going through Paris) and I wish we'd packed our salopettes in hand luggage! The skis came in on the first day, but we were forced to drink wine on the sun terrace which was terrible..! The hotel were very good and gave us a bag of toiletries and t-shirts. We were very pleased with Air France in the end as they came through and reimbursed us with cash. The accommodation is very good, our bedroom was fine for the 3 of us and the bathroom was fine. Staff very nice. The hotel is very geared around the French and there arent many English speaking people there, but it wasn’t really a problem. Excellent food, there was a buffet but it had fresh stuff that they cooked for you there and then. We had a lovely New Years Eve dinner with higher quality food (like foie gras and lobster) and the restaurant was beautifully decorated. The location was fine, had there been a little more snow it would have been even easier!